I had my second nest of blue birds leave their nest a couple of weeks ago. I found a little dead baby in the nest when I cleaned in out this week. This got me to thinking about birds and feeding and attracting them. I found some good stuff as usual to pass along to you. This first one came in my E-mail newsletter From Garden Club published by Birds n Blooms Magizine. Hats Off to HummingbirdsIt gets very hot here in the summer. The hummingbirds have swarmed to the feeders in the shade, but avoid the ones in full sun. So, I took an old straw hat and fastened it to the top of the feeder with wire and florist’s tape. This next one is a very informative article with a link all about feeding and maintaining a bird habitat. "It’s not just a dog eat dog world out there. We’ve all seen our backyard birds get downright nasty over their food. What and how you feed in your backyards may help bring a bit more peace at the feeders, and more importantly, the choices you make for attracting wild birds to the yard can also affect how well the breeding season goes for some species." 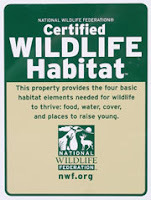 This summer I added my yard to the list of Wildlife Habitats on the National Wildlife Federation's list of wildlife habitats. You can too, see if your yard qualifies at the National Wildlife Federation's website I put my sign on my front fence for all my friends to see. I got the idea from from my blogger friend Ginger who writes a terrific garden blog The Law of the Land , check her out, I think you will enjoy her blog. Thank you for the nice words! That article about the birds is very helpful - I didn't realize how important cleaning the feeders is. I hope your writing is going well. I'm pleased to report that all of the sedum is alive, and much of it is covered with tiny buds - exciting!